This is a super quick way to make delicious pickles - the perfect way to use up those cucumbers that are slightly tough skinned. You can add any flavouring to these - simply add to the bottom of the jar before adding the cucumbers. I used Dill, garlic and some peppercorns. These only need 24 hours in the fridge before they are good to go. 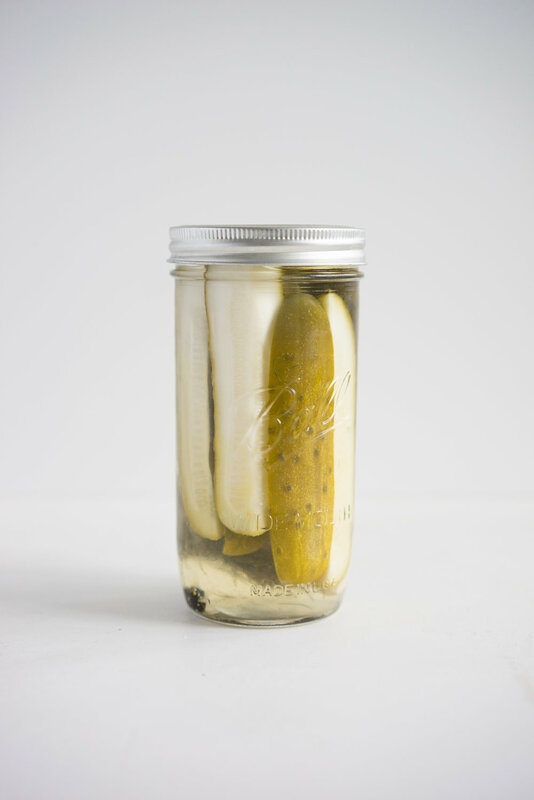 Don't forget to sterilise the glass jars you are using before you make the pickles. Place them in a 350˚f oven for 15 mins, and allow to cool before using. This recipe is just a guide - you can adjust the amount of pickling liquid depending on how many cucumbers you have. It is easy to quickly whip up another batch if needed! Place the garlic, peppercorns and dill in the bottom of your jars. Add the cucumber spears - you want them to be fairly packed in. In a large saucepan, combine the water, white vinegar, sugar and salt over medium heat. Bring to the boil, remove from the heat and allow to stand for 5 minutes. Carefully pour the hot pickling liquid over the cucumbers, leaving about a 1/2 inch of space at the top. Place a lid on the jar, seal tightly, and allow the jars to cool to room temperature. Once cool, transfer to the fridge. Store in the fridge for at least 24 hours before using.